So you’re going to be a voice actor, really? Voice artist or voice over is one of the most enjoyable professions in the entertainment business. Friends and associates often ask me how to get into voice acting. Compassionate lines in a script sometimes make folks believe it’s easy to be a voice actor. Well, I’ll let you be the judge of that. To those looking for the opportunity to make their dreams come true as a compassionate communicator or as an over-the-top movie trailer orator, I encourage you to consider my tips on getting into voice acting. A new voice talent must first “think” like a new business. Below is my short list of how to begin thinking and being a voice acting business. Consider your reason for wanting to voice act: Think about why you want to be “in the business.” If you want, jot down your reason or reasons. Don’t worry, you can revise it later if you want, I won’t tell. Drop the attitude, please: Voice acting is what I call a “service business.” All the pros I know have an attitude to serve others with excellence. The pros know that it’s not about having a great voice, but about bringing a script to life! Start to make connections through the Internet: Start by doing word searches on Do a word search on voice over, acting, etc. Follow talent you find and like on Facebook, Twitter, etc, but in a causal friendly manner. You are seeking to develop new business connections not looking to stalk top voice over talent. 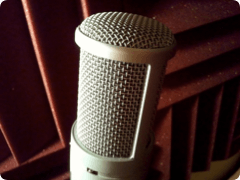 Find out all you can about voice acting for free: Before you sign up for that class that promises to make you a killer demo and voice over star in one year or less, do your homework. There are many sites that offer free advice on how to start developing your craft. You can take out the check book later. Next time, I’ll will warp up my best tips on becoming a voice talent. So for now, have fun with your homework.